We are excited to share with you the news that Belmond Eagle Island Lodge has been selected to undergo a complete refurbishment and upgrade in 2015! This is a valuable and essential investment by Belmond in the lodge which promises to deliver even greater safari experiences when completed. The closure of the lodge will commence on the 5th January 2015 and last for a 6 month period, with them expected opening date being the 01st July 2015. When reopened in July 2015, Belmond Eagle Island Lodge will become our flagship luxury property in the Belmond Safaris portfolio, and promises to be an unparalleled experience for future guests visiting this much anticipated Belmond lodge! Although still in the early stages of planning and implementation, we wanted to share some initial information on the refurbishment with you. What will the refurbishment of Belmond Eagle Island Lodge entail? The refurbishment will almost be a complete rebuild of Belmond Eagle Island Lodge, the only structures that will remain from the old lodge will be the room base structure, which in turn will be extended. The works will include a complete new main area, lounge, bar, library, curio shop and reception, as well as a brand new room design that will be placed on the current room base structures. In addition, the refurbishment will also include a brand new ‘back of house’ and staff village which will greatly benefit our loyal staff based at the lodge. How will this affect confirmed bookings already received over this period? We will inform the affected bookings with immediate effect, and will work hand in hand with the channel and person responsible for the booking. Our first priority will be to determine whether any of our other lodges are appropriate alternatives, and if so (and should availability allow), move them across to an alternate Belmond lodge. Should our own lodges not be suitable, we will then recommend suitable alternative lodge accommodation, and assist with the moving of these bookings to the new lodge, which will then be held by the booking agent or client under their respective names. Please note the helicopter will be based at Belmond Khwai River Lodge for the duration of the refurbishment, and normal booking conditions will apply. After the refurbishment is completed, how will the end product differ from Belmond Savute Elephant Lodge and Belmond Khwai River Lodge? Our ambition is to create Belmond Eagle Island Lodge as our flagship safari lodge, and provide a superior quality lodge experience. 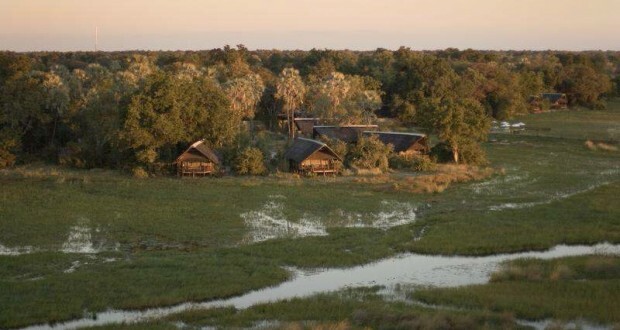 The concept will be to anchor a complete Northern Botswana Safari experience around Belmond Eagle Island Lodge as a true luxury Okavango Delta water safari experience. Coupled together with our two strong game viewing safari lodges of Belmond Khwai River Lodge and Belmond Savute Elephant Lodge, each with their own unique location and experience, it will create an ideal safari circuit of Northern Botswana in consummate luxury with Belmond Safaris. We hope the above information gave an insight into our plans for Belmond Eagle Island Lodge, and please rest assured that we will keep you updated and informed on any developments as they happen. We thank you sincerely for your cooperation, understanding and support during this affected period, and should you have any queries or concerns please do not hesitate to contact Belmond directly. Belmond Safaris (formerly Orient-Express Safaris) is proud to announce the introduction of its Long Stay Rates for the remainder of 2014 and into 2015. With the combination of their three luxury safaris lodges working in perfect synergy, the eagerly awaited Long Stay Rates will be a great benefit for clients wanting to get a full experience of the three amazing, yet completely contrasting, ecosystems of Northern Botswana. These include the floodwater of the Okavango Delta; the leadwood forests of the Moremi Game Reserve; and the semi-arid region of the Chobe National Park. For more information visit www.belmondsafaris.com, or please contact safaris@belmond.com.